Maple-Modulo was founded in 2008 by Hiroshi Hanada. 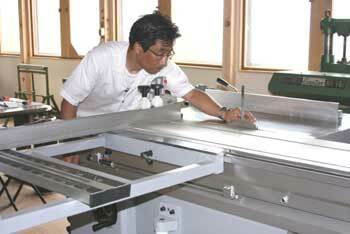 The business opened its workshop in Kitakyusyu Fukuoka, and started producing custom furniture. In 2010,the business started a woodworking classroom, that was different from general woodworking classrooms. Students can learn high level techniques, gain knowledge and improve step by step by our well thought-out curriculum. As a result, students came from distant areas and the number of students increased steadily. In 2019, we start a furniture design project and launch a furniture brand designed by Hanada. Through a process of refinement and trial and error, we make a prototype. After that, we outsource it to a manufacturing company in Japan for mass production. In the beginning, we only sell the products in Japan. But we intend to sell it to overseas from 2020.
copyright©2008 Maple-Modulo all rights reserved.